Shiny Hoothoot in game: 41 Who? Important notice! 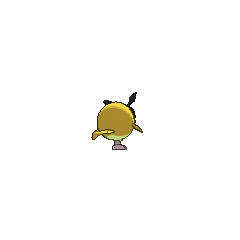 Pokemon Shiny Hoothoot is a fictional character of humans. Hoothoot is a round, owl-like bird with two stubby wings and a short, fan-shaped tail. It has large red eyes with beady pupils. Its feathers are mostly brown with a beige underbelly. 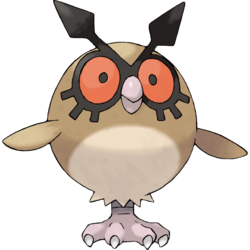 Hoothoot has a large black, mask-like crest, which encircles both eyes and covers the face. The crest has two protrusions at the top resembling the hands of a clock. The parts of the crest below each eye have notches resembling the teeth of a clockwork gear. Hoothoot has a small, hooked beak and two feet with five digits. Although it will typically only stand on one foot at a time, it alternates between the two at speeds too difficult to track with the naked eye. Inside Hoothoot's body lies a special organ that senses Earth's rotation, allowing it to keep track of time. Hoothoot is well known for its ability to keep rhythm by precisely tilting its head in time, much like a metronome. Every day at exactly the same time, a Hoothoot will begin hooting. Hoothoot is most commonly found nesting in trees and forests. Hagatha and Nagatha from Illusion Confusion! rented Hoothoot to Trainers, including Gary Oak, so they can get through a haunted forest. Falkner, the Gym Leader of Violet City, has a Hoothoot, as shown in Fighting Flyer with Fire. Wings Alexander used to have a Hoothoot before it evolved as seen in Throwing in the Noctowl. A Hoothoot appeared in A Staravia is Born! where it teamed up with Ash's Starly to hypnotize Meowth to helping the other bird Pokémon escape. It is later seen flying away with the other bird Pokémon waving goodbye to Ash's newly evolved Staravia. A Hoothoot appeared in Pikachu and the Pokémon Music Squad. 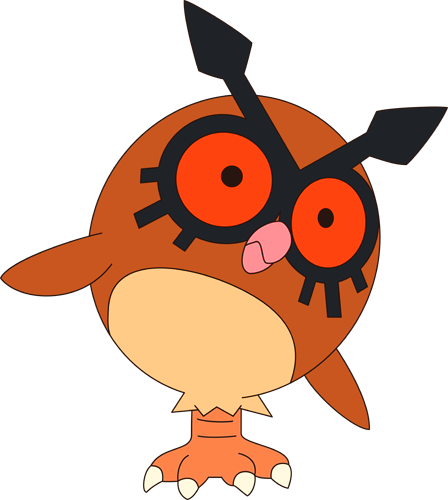 Hoothoot first appeared in Pikachu's Rescue Adventure. A Hoothoot appeared briefly in Mild 'n Wooly getting blown across the screen by the approaching storm. A Hoothoot was one of the Pokémon seen at the Pokémon Swap Meet in Tricks of the Trade. A Hoothoot appeared in Pikachu and Pichu. 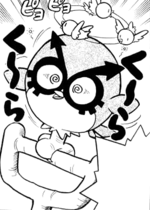 A Hoothoot also appeared in Celebi: Voice of the Forest. Two Hoothoot appeared in The Legend of Thunder!. One was seen outside the Pokémon Center standing in the hollow of a tree, while the other one was seen inside the Center with its Trainer. A Hoothoot was used by one of the students of the Pokémon Trainer's School in Gonna Rule The School!. Another Hoothoot appeared in Less is Morrison. A Coordinator's Hoothoot appeared in Spontaneous Combusken! participating in the Chrysanthemum Contest. Two Hoothoot apperaed in Dawn of a New Era!. Multiple Hoothoot made a brief appearance in Coming Full-Festival Circle!. Another Hoothoot appeared in Zoroark: Master of Illusions. A Hoothoot apperaed in The Dream Continues!. A Hoothoot appeared in a flashback/fantasy in The Forest Champion!. Hoothoot debuted in The Legend when two were seen hanging under some tree branches when Green had finished her message to Silver in Johto. In Murkrow Row a Hoothoot is seen flying at night while Gold was playing cue balls in his room, and again later when Gold asks Joey if he recorded the DJ Mary's song. Crystal mentioned she captured a Hoothoot on her way to Professor Elm's Lab in Three Cheers for Chikorita. 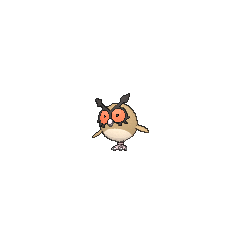 Another Hoothoot was one of the Pokémon sent to help the fight in Ilex Forest in The Last Battle XIII.